Those who attended dedication ceremony for the new interfaith chapel at Beebe Medical Center include the following, left to right: back row: Anita Smulyan and Cheryl Fruchtman of Seaside Jewish Community; Deacon Bill McGann, of St. Jude the Apostle Catholic Church in Lewes; Nick Edge of Insight Meditation Community of Lewes; Beebe Medical Center Chaplain Keith Goheen; Reverend Fred Duncan, Bethel United Methodist Church of Lewes; Patricia Damiri of Mitchell Design; and Pat Sandy, Beebe Medical Center Auxiliary Board member. Those in the front row, left to right are: Michael Clemmer, Beebe Auxiliary President; Jeffrey M. Fried, President and CEO of Beebe Medical Center; the Honorable William Swain Lee, Chairman of the Beebe Medical Center Board of Directors; and Paul Mylander, Chairman of the Beebe Medical Foundation Board of Directors. 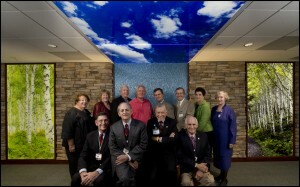 Lewes and Rehoboth Beach religious leaders recently joined the Board members of Beebe Medical Center, the Beebe Medical Foundation and the Beebe Medical Center Auxiliary, as well as physicians and staff, at the dedication ceremony for the new interfaith chapel located in the hospital. The joyous yet solemn occasion marked the opening of the chapel, available to all who visit Beebe Medical Center, and the culmination of two years of planning and interior renovations. The chapel is located on the first floor of the hospital in the main elevator-bay lobby. During the ceremony, Beebe Medical Center Chaplain Keith Goheen described the chapel to those attending the ceremony as “a quiet, restful space” for personal reflection, spiritual devotion, and a reverent place where all hearts and prayers are welcome. Participants representing area religious groups included: the Reverend Fred Duncan from Bethel United Methodist Church; Nick Edge from Insight Meditation Community in Lewes; Deacon Bill McGann from St. Jude the Apostle Catholic Church in Lewes; and Anita Smulyan from Seaside Jewish Community in Rehoboth Beach. Speaking on behalf of Beebe Medical Center were Jeffrey Fried, President and CEO, and The Honorable William Swain Lee, Chairman of Beebe Medical Center Board. Judge Lee reminded those attending how important it is to have a quiet, spiritual place in which to go within the walls of a hospital. The theme of the chapel is one of nature, with depictions of forest, water and sky. Stone bricks cover some walls to create a sense of earth. Religious items for reflection and devotion are available for individual use.